Great app. Simple and elegant. SDF time is wrong though it’s est which is -5gmt right now not -6. 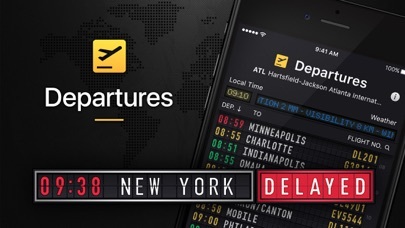 So all flights displayed are 1 hour behind. This is the best app. I use it all the tome and find it to be very reliable and accurate. Get it!!! Great app, please tweak just a bit. Love the app. It looks great. Awesome concept and easy to use. I love that you can toggle on and off codeshares. Very few travel apps offer this and it always drives me crazy! That’s a fantastic feature. A few comments: 1. 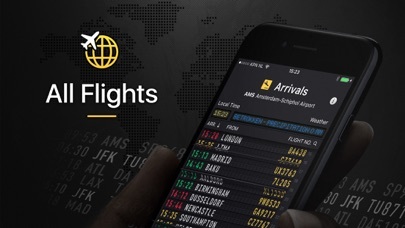 Once you’ve chosen an airport, when searching/filtering by specific arrival/departures, you search by city name. It would be nice to also search by airport code so you don’t have to type “New York” but could type “LGA” or “JFK.” Both options would be awesome. 2. Can you show the type of aircraft somewhere? 3. Also, the old Mobiata Flight Board didn’t open a separate window to display more flight details, it displayed it as a small drawer that opened/closed when you tapped one of the flight options. That was nice for quicker viewing and less tapping back and forth when looking for options. That’s it for now! The developers have done a great job with the UI for this app! The flip-style graphics are undeniably charming. Unfortunately I can't use it regularly until they make two fixes: 1. Stop treating codeshares as if they're equivalent. They're not! What we want to see in 99% of cases is the operating carrier. List flights by the operating carrier's IATA code and relegate codeshares to the detail screen. There is absolutely no good reason for codeshares to rotate in and out on the main screen, as is the case at present. 2. 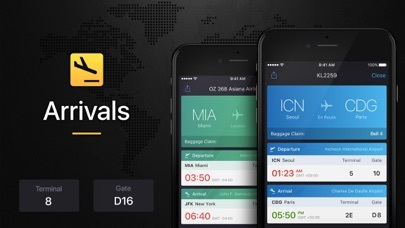 Allow the lists to be sorted by airline, in addition to time and destination. I often want to see all of a given airline's departures from an airport, and at present that's impossible. Baggage claim info for Sydney-Kingford Smith mostly "n/a"
Although baggage claim info are available from the airport's website, it's shown as "n/a" in the app for most of the flights, even hours after the flights have landed. All the info shown in the app is available for free on the web. 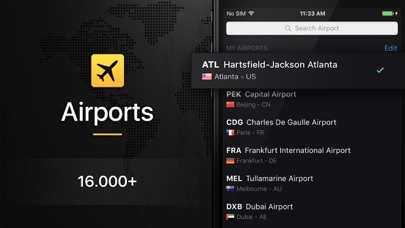 The value of this app to me, is it should consolidate the info in one place, so that I don't have to go searching all over the web for every airport I visit. The app has failed me in this case. I'm using the paid 'pro' version. This app looks really nice but is not 100% functional for what people need it for. The airline codes are all wrong. For example, there is a flight from SLC-SEA that has the airline code BAW1234 and that is British Airways. You then click on it knowing that can’t possibly be correct and the inside page says Alaska Airlines... so.. please fix your coding. Also, I don’t want to see advertisements for your other apps at the bottom of my page. The whole reason I paid for the pro version was for no advertising. I look forward to your future updates.